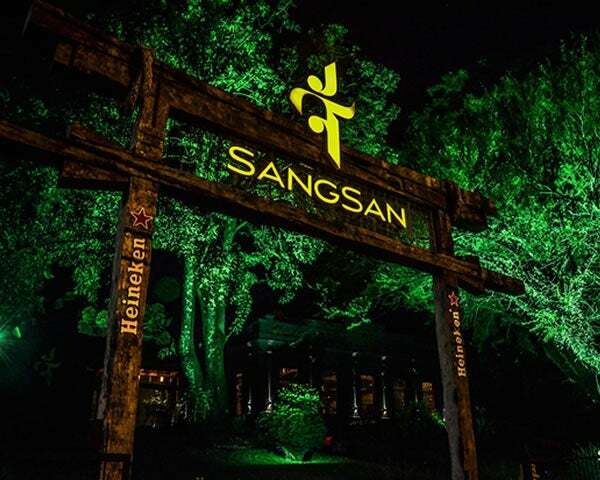 Bringing a taste and, most importantly to us, a sip, of Asia to Passo Fundo in Brazil, Sangsan Asian Lounge is a true star of both the city's nightlife and dining scene. Bringing a taste and, most importantly to us, a sip, of Asia to Passo Fundo in Brazil, Sangsan Asian Lounge is a true star of both the city’s nightlife and dining scene. Drawing inspiration for its name and decor from far away and exotic Chiang Mai, Thailand, the sleek temple-like Sangsan takes diners and cocktail drinkers on a true escape to the other side of the world without ever having to leave their seat in their beautiful Brazilian restaurant. Walking under their towering wooden gate entrance – no doubt inspired by majestic Japanese torii gates – you begin your journey east, while inside the stone facades, golden gong, red candles, statues of dragons and Buddha complete the illusion of the orient. The cocktail list is full of Eastern flavors like the Lychee Martini; shaken with premium vodka, lychee juice, lemon and rose syrup and garnished with a touch of Lychee, and the Sangsan house special; vodka, sparkling wine, strawberry, lemon, and ginger. The drinks are sipped by a stylish and sharp-dressed crowd who love to linger at the bar after dinner to be seen. As far as the Asian tastes, Sangsan’s are a blend of Japanese and Thai, with the chefs having the go-ahead to be as creative or traditional as they would like. Sushi is a scintillating staple of the menu alongside spicy wok cooking.